When you have a baby, space becomes premium. You can end up with so much stuff that your house looks like an overstocked shop! And wait until you want to travel somewhere! Even if you’re going on holiday or taking your little one away for the evening to their grandparents or a friend’s, to the beach or on a picnic, you still need to plan exactly what to take and usually it’s a lot! So it’s great to find one product that is so compact and lightweight you’ll want to take it out n’ about with you whenever you’re on the move with baby. The NSA UK Travel Centre is a versatile pop-up travel product that’s great for indoor or outside use. 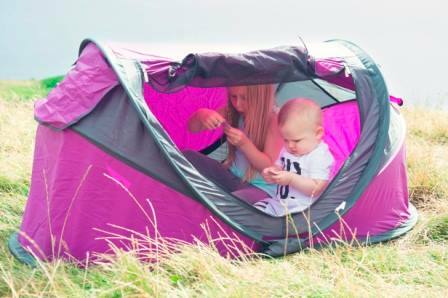 It’s a travel cot, play tent and even a sun shelter. The travel cot provides a comfortable play area for baby as well as a sleeping area with a self inflating mattress, sleeping mat and an insect mesh when its time for a rest. This travel cot pops up and folds away in seconds and takes up very little space. so it’s a massively convenient solution for any family on the move!